Interesting to read Stephanie Simon's piece in the WSJournal on Why Did the Elk (or Bear or Deer or Lynx) Cross the Road? 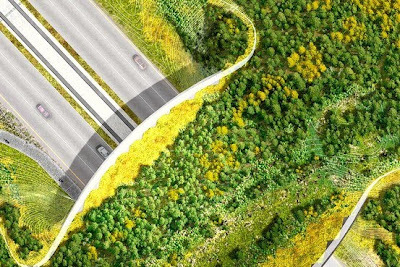 "Getting elk to cross highways safely -- and encouraging lynx, bear, deer and bighorn sheep to follow suit -- was the key challenge in an unusual global contest that concluded this month. 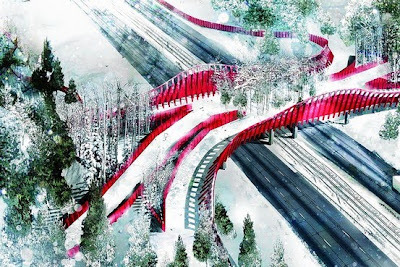 The ARC International Wildlife Crossing Infrastructure Design Competition asked engineers, ecologists and landscape architects to come up with an overpass bridge for pedestrians of the furry sort. 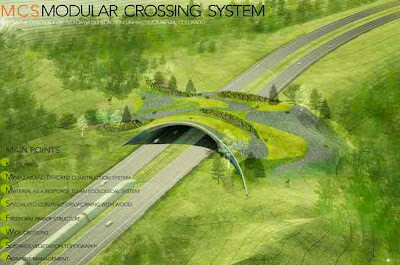 The goal: to encourage wildlife to roam freely across their habitat -- even when that habitat is bisected by a highway. 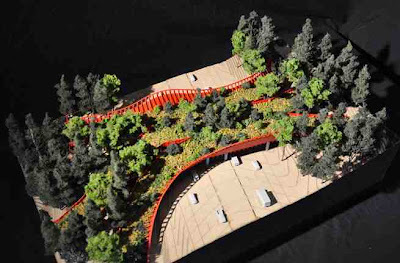 The five finalists, unveiled last week in Denver, designed multimillion-dollar bridges that aimed to tempt animals across with tasty foliage, green valleys, gentle streams and curved walls to block out noise and vibrations from the traffic below."